Water. Such a seemingly simple thing and yet it’s an important yet often overlooked subject. "Ensure clean, fresh water is available to your bird at all times and change it often.” You hear that said and see it written and touted everywhere. It’s in books, manuals, on websites and in articles. But the song remains the same: Fresh water is really important. We tend to take it for granted and we shouldn’t. It is indeed what is 71 percent the earth, but it is also a large percentage of any liquid in living things. It’s kind of a conundrum. It is transparent, it has no calories and it doesn’t nourish us, yet it is vital to life. It is the only liquid that occurs in nature in three forms: solid, liquid and gaseous state. It is a natural and common solvent and it is critical for removing waste matter from a life form. Again, water is really important. In fact it’s critical. It’s also critical to life forms we don’t particularly want for our birds, such as bacteria and fungi. Mold is a fungus that needs water to survive. Aspergillus is one example of a fungal infection you really don’t want your bird to get. Changing her water after scrubbing the bowl with a stiff brush, hot water and soap is one way of preventing aspergillosis. There is a lot of of these microscopic creatures everywhere. These microscopic creatures are found in dirt and in bodies of water. Airborne contaminants float in the air. and they can drop into your bird’s water at any time. Normally, this isn’t a problem if your change the water in the bowl and give it a good scrubbing with hot water, a brush and some dish soap, or just by running the water bowl through the dishwasher. Your bird gets clean water in a clean bowl and no harm done. The microscopic bacteria guy that invaded your bird’s water didn't get enough of a chance to multiply because you sent him on his merry way down the drain and replaced it with fresh water. When he first dropped into the bowl for a dip he was going through his "lag phase.” (getting used to his environment) He’s not multiplying, he’s just kind of idly swimming around in the bowl, lazily backstroking his way through the pool, checking things out and acclimating. But once he adjusts, he busily begins multiplying and feeding himself on the leftover crumbs and food items that were washed off your bird’s beak when she took a drink. This is is called the "log phase” and it’s the critical and dangerous part of the process of multiplying bacteria. This can be a real problem if any of your birds are "dunkers” and like to give their food a bath before consuming it. One single bacteria probably won’t make your bird sick. Ten or 12 probably won’t make her sick. But let little bacteria guy start creating a family and that’s where the trouble starts. If one bacteria divides and then those two divide (this process is called binary fission), you can in a short period of time have billions of bacteria. This is why you want to change the water before this occurs. Preventing any possible contaminants from getting in the bowl is a good tip as well. For instance, if you often find bird poop in her bowl. 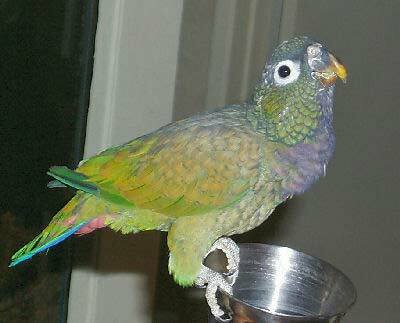 Either move the bowl, or move whatever perch or other item over the bowl it is that’s allowing your bird to poop in it. I had this issue with some Zebra Finches I had adopted. I hadn’t noticed that a perch ran across over their water bowl attached to the side of their house. Simply moving the location of their water and bowls to the opposite side of the cage solved the problem. A water bottle along with a fresh bowl of water is a good idea as well as several sets of water bowls for each cage and play stand. This allows you to pull the bowl in cage and immediately replace it with a bowl of fresh water without having to run right to the sink to immediately wash and refill the bowl. And yes, you’ll want to wash and refill the water bottle daily as well. Make sure that the water can flow freely through the tube when the little ball bearing is jiggled. You can test this by touching the ball bearing with your finger. If water comes out, you’re good to go! 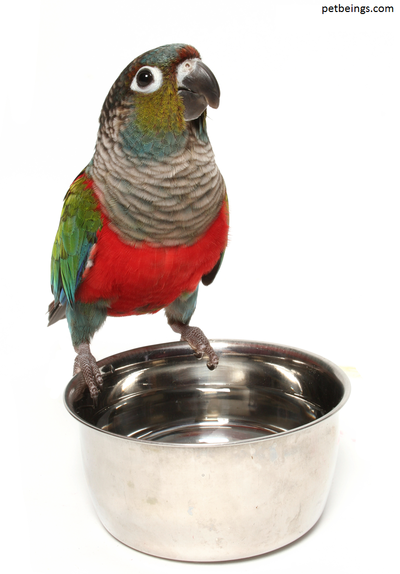 Avoid adding any nutritional supplements to your bird’s water. If this is not possible, I would suggest changing the water more frequently. As you can see, water may be a simple thing. But sometimes it’s the simple things that are most important.